Edward L. Rowny was born April 3, 1917, in Baltimore, Maryland. His father was a Polish immigrant and his mother a first-generation Polish American. In 1933 he entered Johns Hopkins University. In his junior year, the Kosciusko Foundation sent him to study at the Jagiellonian University in Cracow. While there, he attended the 1936 Olympics in Berlin. After a year in West Africa, Rowny returned to the United States to be a member of the newly formed 92nd Infantry Division. By the summer of 1944, Rowny had risen to the rank of Lt. Colonel and commanded a combat engineer battalion. The 92nd Infantry Division was deployed to Italy where it joined the offensive against the Germans along the winter line in the Alps. Combat casualties were so heavy that Rowny was transferred to the infantry. The division took part in the spring offensive and by VE Day had reached the Italian border. Rowny had earned two Silver Star medals for gallantry in action and two Legions of Merit for extraordinary service. After a year in the Pentagon, Rowny went to Yale where he earned two masters degrees: one in engineering and one in international relations. In the fall of 1949, he was dispatched to Japan where he joined General Douglas MacArthur’s planning staff. When South Korea was invaded on June 25, 1950, General MacArthur appointed Rowny as his official spokesman. For the next several months Rowny was one of the three planners of the Inchon invasion. Rowny, as the X Corp engineer, was promoted to the brevet (temporary) rank of Brigadier General even though his regular rank was that of Lieutenant Colonel. 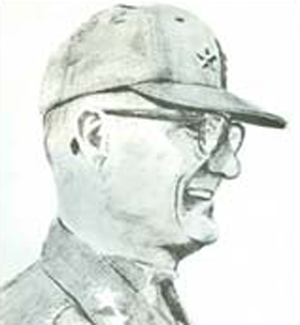 In the summer of 1952, he became the head of a department at the Infantry School at Fort Benning, Georgia. From 1955 to 1958 he was Secretary of the General Staff to Generals Gruenther and NORSTAD, the commanders of U.S. Forces in NATO. From 1966 to 1968 he commanded the 24th Infantry Division in Europe. In 1971 he was promoted to the rank of Lt. General and was assigned to command the ICORP in Korea. From 1973 to 1979 he was the Joint Chiefs of Staff representative to the SALT II negotiations. He resigned from the Army in protest in June 1979 when President Carter signed the SALT I Treaty, which Rowny believed was fatally flawed. President Reagan awarded Rowny the Citizens Medal for being one of the “chief architects” for “Peace Through Strength.” Since retiring, Rowny has continued to act as an advisor on national security and homeland defense and has engaged in several philanthropic activities.